U2’s latest album, Songs of Experience, debuted at #1, giving the band #1 hits in every decade since the 80s (they are the first band to achieve that milestone). Many of those sales were the result of a deal that packaged a copy of the album with tickets to their current tour, a gimmick many acts are adopting to boost album sales. As gimmicks go, it’s not as audacious as the one they tried with their previous album, 2014’s Songs on Innocence, when they automatically uploaded copies of the album to every iTunes customer in the world. That didn’t go over so well. Today’s Random Weekend selection had twice the chance of showing up because I have it on two different albums. Originally released as the final track of U2’s 1993 album Zooropa, it was later selected for Johnny Cash’s compilation album The Legend of Johnny Cash. It’s the Cash album version that popped up when I spun the old iTunes wheel, but the two are identical (save for a minute of silence tacked on to the end of the U2 track). One interesting aspect of U2, one of the most popular rock acts of all time, is that they’re essentially a Christian rock band. Most Christian rock bands explicitly market themselves as such, rather than seeking a wider audience. Presumably, they see their music as a form of proselytizing. U2 doesn’t do that. But so many of their songs are about a relationship with God that they certainly could have gone down that path. Our next Montauk Madness matchup pairs two legends, one who sadly (and triumphantly) passed away last year and another struggling to remain relevant after spending the better part of four decades as the world’s greatest rock band. David Bowie vs. U2. Had I faced this decision before Bowie’s passing, I likely would have gone with U2. Apart from the hits, I knew Bowie’s work mostly by reputation. Of course, Bowie’s hits alone put him in contention, but I own almost all of U2’s albums and consider them at worst enjoyable and at best masterpieces (The Joshua Tree remains one of the seminal listening experiences in my life as a music fan). Well, here’s a somber opportunity for the old “Is today’s Random iTunes selection appropriate for the occasion?” game. Today is the 15th anniversary of the September 11th attacks. So let’s spin the wheel and see what the Random iTunes Fairy comes up with to acknowledge the milestone. 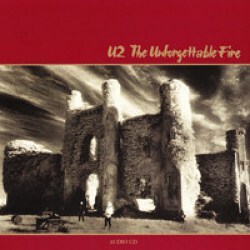 OK. A deep cut on U2’s fourth studio album, The Unforgettable Fire. Could be better, could be worse. Now that I’ve counted down my woefully incomplete list of favorite 1980 albums, I’ll turn my attention to the records from that year I haven’t heard. I’ll highlight songs from the most critically-acclaimed 1980 albums over the next several weeks. U2’s debut album, Boy, came out that year, kicking off one of the most storied careers in rock history. It would be three years and two more albums before they earned their first gold record (with War) but this album was praised as a promising start for a brash Irish band led by a charismatic 20-year-old.